Join our training events for an in-depth review of Zoom's services. Submit your questions and interact with us! All attendees receive a recording of the event. 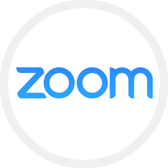 Ready to start using Zoom, but need some help? Drop-in for our daily (Mon-Fri) quick starts! A Zoom expert will take you through a 30-minute high-level tour of Zoom and cover the basics to get you up and running. It’s as simple as logging in, scheduling a meeting, and finding the controls. Start Zooming today! Stick around to get all your burning questions answered through live Q&A! Unable to join us live? Please view a recent recorded training session.